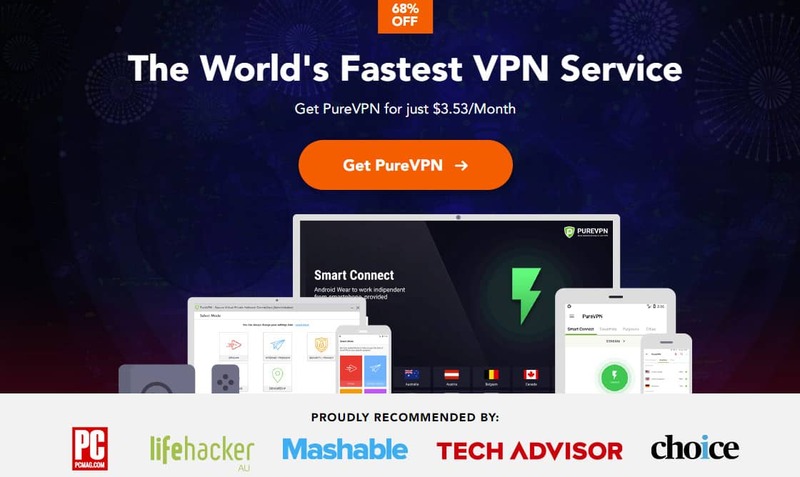 PureVPN review 2019: Have this VPN's privacy issues been fixed? 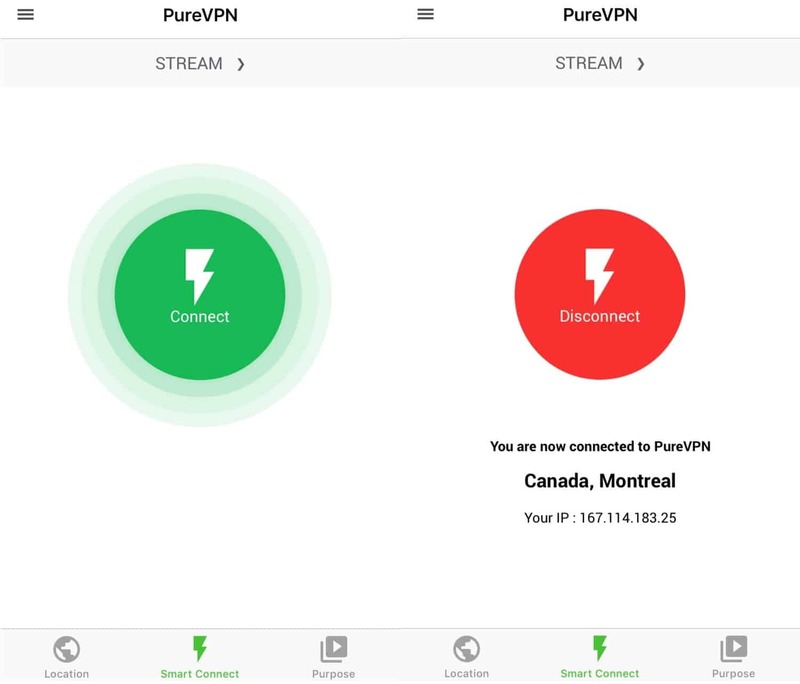 PureVPN review 2019: Have this VPN’s privacy issues been fixed? PureVPN offers strong security and the ability to unblock US Netflix. It pegs some fast speeds but has some connection issues. We’ve tried out the service to offer a full view of what you can expect. Find out about pricing, features, security, performance, and more. Let’s jump in! Unlike some providers, PureVPN doesn’t offer a free version. This isn’t a bad thing, as free products typically don’t offer the features most people need from a VPN. There is simply one paid plan which differs in price depending on the length of term you sign up for. To try the service for one month, it will cost you $10.95. You can get a decent discount for signing up for one year at $5.41 per month, but the steepest discount is for a two-year plan at $3.53 per month. Overall, prices are about average compared to other large providers, although we have seen some better deals on one-year terms. All plans come with a seven-day money-back guarantee, which is nice, but is pretty tight considering many providers extend this to 30 or even 45 days. There is one more option if you’re really on the fence and that’s to sign up for a three-day trial for a non-refundable fee of $2.50. PureVPN offers a large selection of payment options, including most major credit cards, PayPal, Alipay, various coin payment platforms, Cashu, and even gift cards. So what does your money get you? Once you sign up, you can use the service on up to five devices simultaneously. Apps are available for Windows, MacOS, iOS, Android. PureVPN is compatible with Linux and various devices, including Amazon Fire TV and Amazon Fire TV Stick. You’ll have access to a decent network of over 750 servers in more than 140 countries. 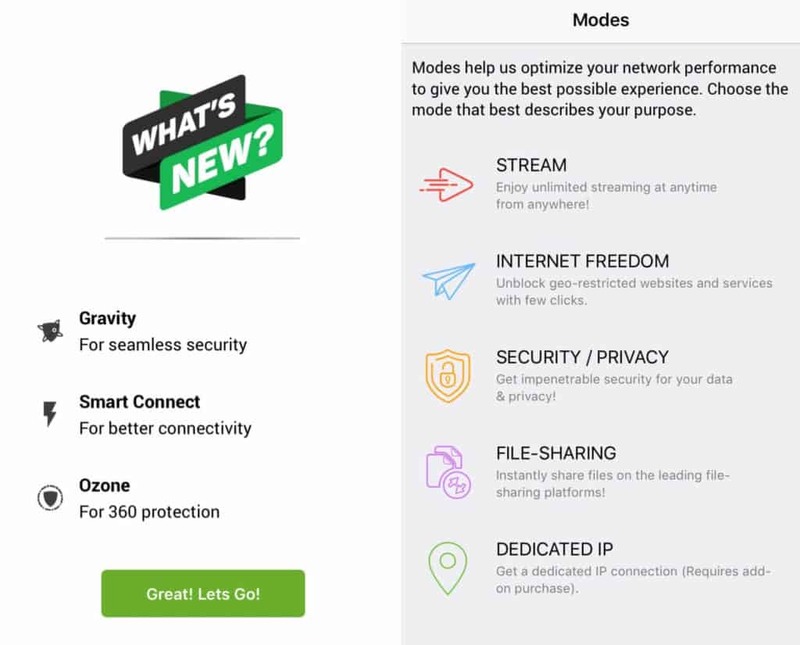 The service includes unlimited data transfer and a neat split tunneling feature to enable you to be selective about which data goes through the VPN connection. You also have malware protection, ad blocking, URL filtering, and app filtering. Multiple encryption protocols are available and the app comes with IPv6 leak protection and a built-in kill switch. Once you’ve paid for an account, you’ll be sent your username and password to the email you provide. You can then use this to log into the service on up to five devices at the same time. For the purposes of this review, we tested the apps for Windows and iOS. Once you download and install the app, you’ll be prompted to enter your credentials, found in the aforementioned email. Then you’ll arrive at a screen which asks you to select your mode. According to the descriptions on the dedicated support page, the choice you make will have an impact on security, anonymity, privacy, and speed. For our tests, we chose Internet Freedom, which seems to offer the same as Security/Privacy. You’ll then arrive at the main screen, which by default will ask you to connect to a US server. To change this, simply click the dropdown to see the list of countries. The list includes additional info, including which servers are virtual and which are recommended for P2P. If you want more specific locations, you can switch to the City tab or use the search bar. Alternatively, if you want to search by purpose, you can switch from Location to Purpose at the top of the screen. You can mark certain countries or cities as favorites for easy access. The other two options here are to visit the dashboard or to change mode (which is also accessible from the dashboard). When you hit Change Mode, you’ll see a screen similar to the one we saw earlier with five options: Stream, Internet Freedom, Security/Privacy, File Sharing, and Dedicated IP. To access your settings menu, click the gear icon in the upper right-hand corner of the client. Here, you have a number of tabs to explore. We’ll cover the most noteworthy. In the App Settings tab, you can adjust the settings for the app launch, select your desired protocol, and change the language. Below that, the Select Mode tab takes you to a similar screen as the Change Mode one we saw earlier. Next you have Advanced Options with a few expansions. Expanding the Security item will allow you to enable 256-bit encryption, opt to only use PureVPN DNS servers while connected, enable IPv6 leak protection, and set a reminder to tell you if the VPN is not connected. 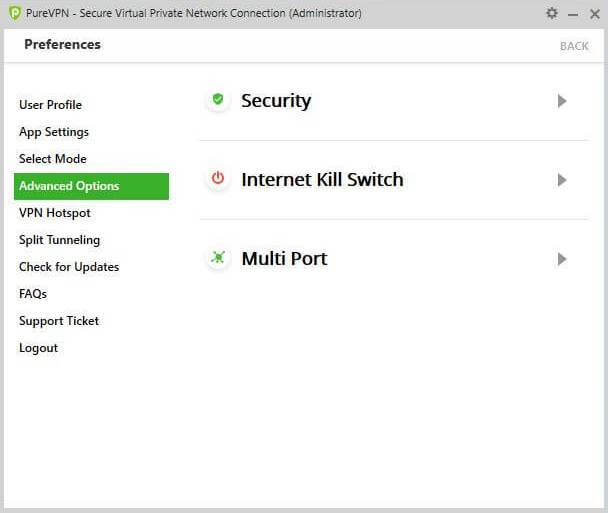 The Internet Kill Switch expansion is where you enable the kill switch, as well as alter other connection settings. A kill switch halts all internet traffic when the connection unexpectedly drops until it is restored. Finally, the Multi Port section houses options for automatic port selection. This checks for closed or regulated ports and selects the best ones for establishing a connection. This is handy if you want to avoid running into port blocking issues. Next you have the VPN Hotspot tab, which also gives instructions on how to set up a hotspot. And below that are options for split tunneling. Split tunneling is a handy feature that enables you to choose which apps you want to use with or without a VPN. And that wraps it up for the main features of the desktop app. As you can see, you have a robust set of options, and advanced users will no doubt be happy with the high level of customization available. When we tested the PureVPN iOS app last year, the setup was cumbersome and changing servers was a far more awkward process than you’d find with other providers. Overall, it didn’t offer a very user-friendly experience. Thankfully, the whole app has been overhauled, complete with a modern look and simpler setup. Once you log in, you’ll get a popup showing some of the updated features of the app. The first is Gravity, a beta feature comprising a series of secure DNS servers. Then you have Smart Connect which refers to one-click server connection, something that is typical for most VPN apps, but wasn’t available in PureVPN’s previous iOS incarnations. Finally, there’s Ozone, which combats viruses, malware, and ads. Once you’re past this, you’ll be prompted to choose a mode, much like in the desktop client. You’ll then be asked to allow configuration changes which the app takes care of automatically, without you having to actually deal with any of your phone’s settings. Once you’re finally in, a green flashing Connect button appears. This is a bit confusing as a green button often implies you already have a VPN connection, but this one is actually a prompt to connect. When you’re connected, you’ll see a red Disconnect button along with your new IP address and location. To change your location or find a server by purpose, you can use the buttons at the bottom left and right of the screen. Finally, the menu in the upper left-hand corner of the screen has a few options. You can change the mode by simply clicking on the mode you’re currently in, and just below that you can enable Gravity. In the Settings menu, you can you can change your protocol, alter the language, and access the split tunneling settings. This mobile app has a broad range of options as compared to those offered by other providers. With a revamped look and a more user-friendly setup and server switch, it’s now one of the better apps out there. PureVPN has an adequate network of over 750 servers, offering locations in more than 140 countries, although more than half of these countries are covered by virtual servers. 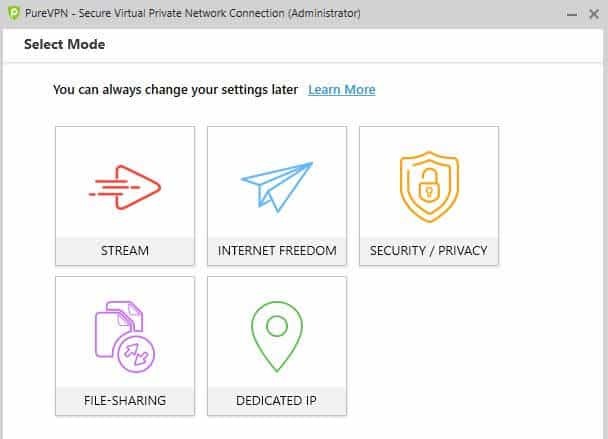 While the selection isn’t quite as big as those of some of its competitors, such as ExpressVPN, there’s definitely enough to satisfy most users. PureVPN assists you in deciding which server to use by providing helpful icons in the server list. You can also mark certain countries or cities as favorites for easy access. Overall, the service we experienced was mostly reliable. We played online games while connected to various US and UK servers with no issues. We also streamed 1080p using the same servers without experiencing any buffering. Connecting and disconnecting from servers was usually quick, but it occasionally took up to a minute. There were a few occasions where the connection attempt went on for a prolonged period, to the point where we decided to simply try a different server. When we run our speed tests, the aim is to be as empirical as possible. We use a test server in Canada and connect to various servers for each provider. 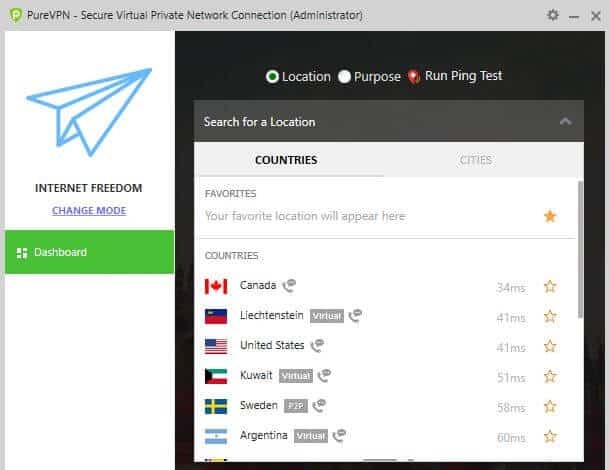 The locations of the test VPN servers are in the US, the UK, Hong Kong, Australia, and Germany. For each test server, a 50MB test file is downloaded from a US server four times per day at six-hour intervals. The average download speed for each test is recorded and displayed in the chart below. In the first Simple tab, you can see how PureVPN compares to other providers we’ve tested, solely based on median download speed. PureVPN is about middle-of-the-pack when compared to the other providers we’ve tested. You can see a more detailed version of our results by switching to the Detailed tab. The spread in PureVPN’s results is very broad, so it may be difficult to predict how long processes will take. It’s worth noting that these tests aren’t definitive and simply serve as a general indication of the performance you might see. The inherent volatility of the internet adds a significant factor of randomness. Depending on your connection, you might see slower or faster or speeds, and smaller or larger discrepancies in results. Accessing Netflix is an ongoing issue for most VPN providers. While some are managing to keep at least some servers working with Netflix, others aren’t faring so well. We tried to access US Netflix using various test servers and were able to seamlessly connect each time. This is a step up from the last time we tested when we had to ask a live chat agent to direct us to a working server accessible via Dedicated IP mode. That being said, if you do run into any issues accessing Netflix, asking an agent for a specific server is a quick and simple fix. We tested other streaming sites in Streaming mode, using the Purpose list to select the appropriate server. Amazon Prime Video (for US) worked seamlessly, but BBC iPlayer was a miss. Indeed, the latter has been cracking down on VPNs recently, so finding a good option can be hit and miss. Does PureVPN work in China? PureVPN can be used to bypass ‘The Great Firewall’ in China. It has a ton of support documentation dedicated to ensuring users in China are able to connect. However, bear in mind that even though many VPNs work in China, their websites may be blocked. If you’re planning to use PureVPN while in China, it may be best to make a copy of the support documentation before traveling as it might be inaccessible from within the country. PureVPN is a Hong Kong-based company and as such is not subject to mandatory data retention laws. However, details of a 2017 FBI case contradicted that statement, as PureVPN’s logs were reportedly handed over to authorities to aid in a conviction. Now, this was a criminal case, and it is fairly standard for VPNs to state that they will hand over information to law enforcement if they possess any. The logs in question were not browsing logs, but connection logs. These involve real user IP addresses and VPN connection times. While they don’t reveal actual user activity, they can be matched with logs from third parties, such as email providers, to implicate activity, as was the case here. Other VPNs keep similar logs, and should disclose this in their terms. With this provider claiming that they keep no logs at all, and then seeing actual logs surface, it understandably unnerved users. PureVPN fares well on the security front and uses 256-bit encryption in conjunction with 2,048-bit RSA keys for authentication. 256-bit encryption is often referred to as ‘military grade’ and is considered as good as it gets. You can choose between multiple protocols for encryption, including OpenVPN, L2TP/IPSec, PPTP, SSTP, and IKEv2. This option appears in the App Settings tab of the client. PureVPN includes an option within the client (in Advanced Options>Security) to opt to only use PureVPN DNS servers while connected. This is a plus for privacy and should protect against DNS leaks. Indeed, we tested for leaks with various servers and observed none. The service also offers IPv6 leak protection and a built-in kill switch. Note that these are not enabled by default so you’ll have to go into Advanced Options to turn them on. The kill switch acts as an additional layer of security so that the internet connection drops as soon as the VPN connection is lost for whatever reason. You can also decide (in the Advanced Options tab) if you want to force the internet connection to drop when you turn off the VPN manually. As a large provider, it’s no surprise that PureVPN comes with a wealth of documentation to help with everything from getting started to troubleshooting and dealing with specific cases like use in China. This can all be found by visiting the Support Center under the My Account tab. If you can’t find what you need or simply have a quick question, the 24/7/365 live chat support is ready to give a prompt response. It is powered by LiveChat, so if you’re looking for additional privacy, you may want to contact the support team directly by submitting a ticket. When we tested this method, the response time was under an hour which is really quick compared to other providers we’ve used. Using the live chat option delivered mixed results. The service was always prompt and we did get help with unblocking streaming sites. On the other hand, we received some vague responses as well as the refusal to answer a basic question about security. 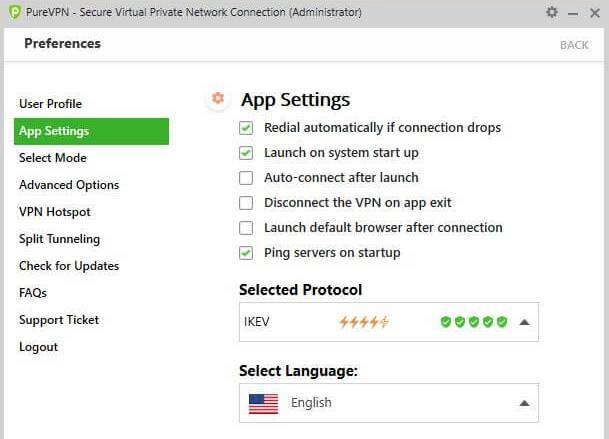 PureVPN provides an easy-to-use interface with plenty of customization options. Performance-wise, speeds are unpredictable and there were some connectivity issues. PureVPN provides easy access to streaming sites like Netflix and Amazon Prime Video. Mobile users will be pleased to see a revamped, intuitive app. When it comes to security, PureVPN ticks all the boxes with strong encryption, DNS and IPv6 leak protection, and a built-in kill switch. The past bad press around its privacy may be a red flag to some potential users, but this provider does seem to be trying to make amends.